I'm a homeschooler but also have years of experience with having children in the public school system. I appreciate the value of an education more so with seeing the decline of so many skills that were common when I was in school. I think every person, parents especially, should embrace the need for solid educational programs to ensure the success of our future. Learning never stops no matter how old you are and what I just learned is something called Best Buy Education. It is a direct-channel division of Best Buy® making it easier than ever to give students the tech tools they need to succeed. The dedicated Account Managers offers consultation to provide knowledgeable, unbiased advice and guide you to the product and service solutions that best meet your needs and budget. So whether you are rolling out new devices in the classroom, launching a BYOD initiative, or upgrading the technology throughout your school, they can provide the products, support and protection you need. I love how Best Buy is reaching out to those in the educational field to help advance the teaching options. Having a single source technology expert for products and services is a brilliant idea especially from such a trusted, reliable brand. They will even be at the ISTE 2015 Conference & Expo in Pennsylvania from June 28th-July 1st. They even offer easy ways to purchase from purchase orders, Net30 forms to P-Cards to Tax-exempt. Even if you aren't involved in the purchasing of technology for your local schools, it's a great way to learn and direct those that are to enhance the programs for learning. 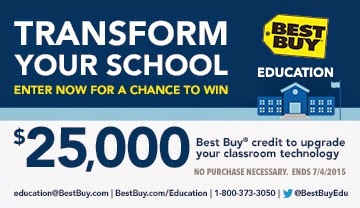 As an extra bonus, Best Buy Education is now offering an exciting sweepstakes that is open to all educators and administrators. The sweepstakes runs now through July 4, 2015 with a grand prize of $25,000 in Best Buy credit, as well as additional prizes of Gift Cards and Microsoft Surface Pro 3 tablets with keyboards. What a great opportunity to win the technology tools and services your students need to succeed. Just visit www.BestBuySweeps.com to enter for a chance to win and view complete details.